Harunobu (1725-70?) who is said to have perfected the full-colored prints known as nishiki-e or brocade pictures, was the first to produce ukiyo-e prints using quality paper and pigments. During the second and third year of Meiwa (1765-66), picture calendars became a fad among the haikai poets of Edo. Wealthy dilettantes commissioned artists to design beautiful calendars and exchanged them at parties with their rivals. Harunobu was an active participant and produced many beautiful calendars, which were overwhelmingly popular. There is another print by Harunobu of the same composition but without the boy, which is more in keeping with the subject matter. However as a ukiyo-e picture, this one is undoubtedly more interesting. 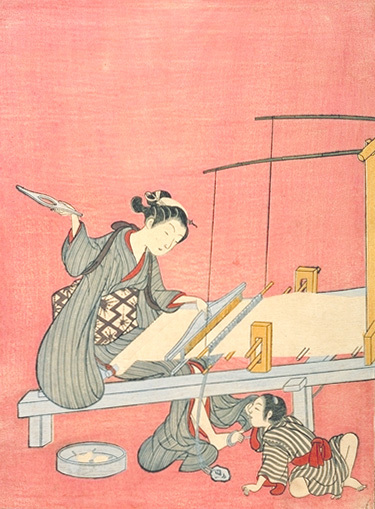 A boy lifts up the skirt of the kimono and peeks while the girl, totally unaware of the boy, is intent on her weaving. A trivial scene expressing the mischievous mind of the boy, and yet Harunobu with his high artistic sense has made it into a delightful scene, with the beautiful color of the background and the lovely girl rendered delicately as only he could. The red in the background gives the picture a dreamlike quality.